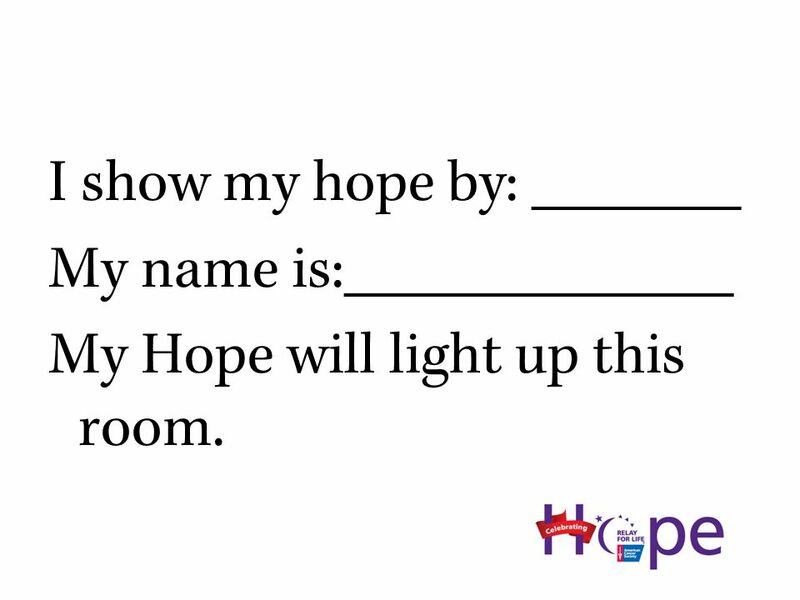 2 I show my hope by: _______ My name is:_____________ My Hope will light up this room. 3 THIS LITTLE LIGHT OF MINE This little light of mine, I’m gonna let it shine. This little light of mine, I’m gonna let it shine. This little light of mine, I’m gonna let it shine. Let it shine, let it shine, let it shine. 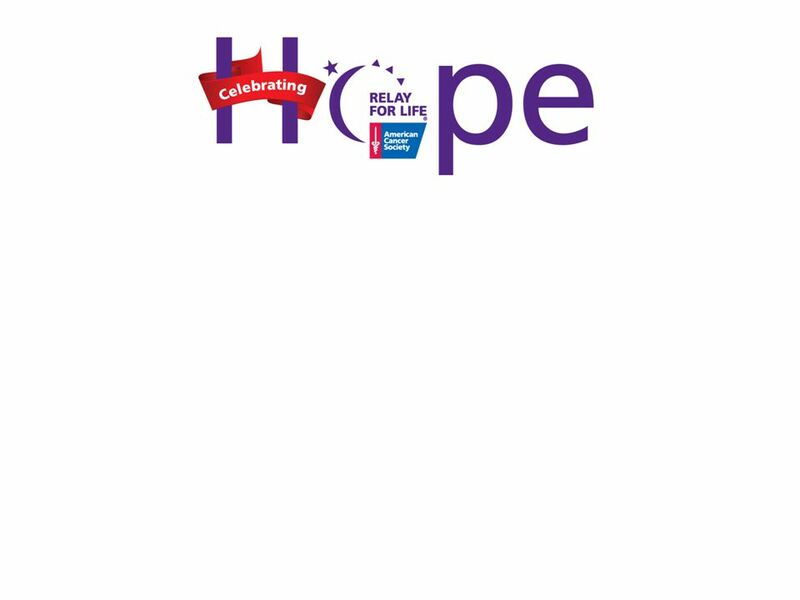 4 Don’t let cancer blow it out, I’m gonna let it shine. 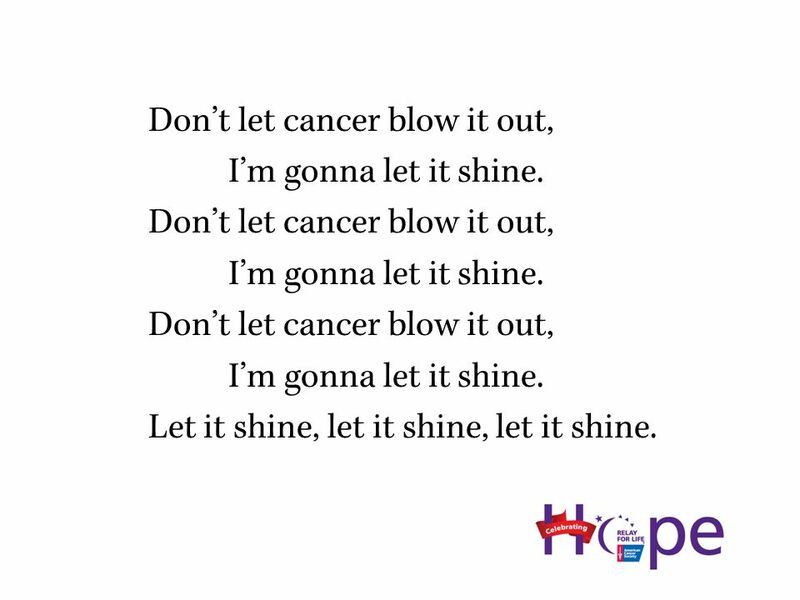 Don’t let cancer blow it out, I’m gonna let it shine. 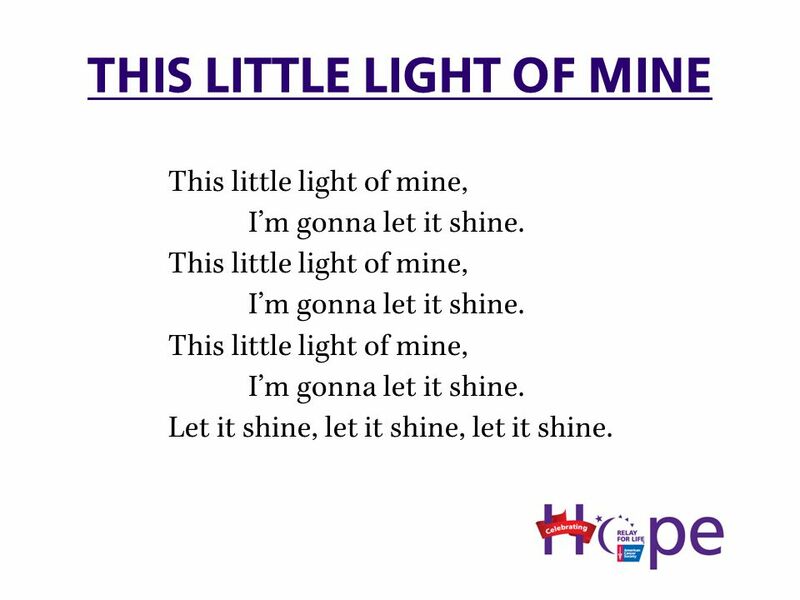 Don’t let cancer blow it out, I’m gonna let it shine. Let it shine, let it shine, let it shine. 5 Hide Hope under a bushel, “NO”, I’m gonna let it shine. 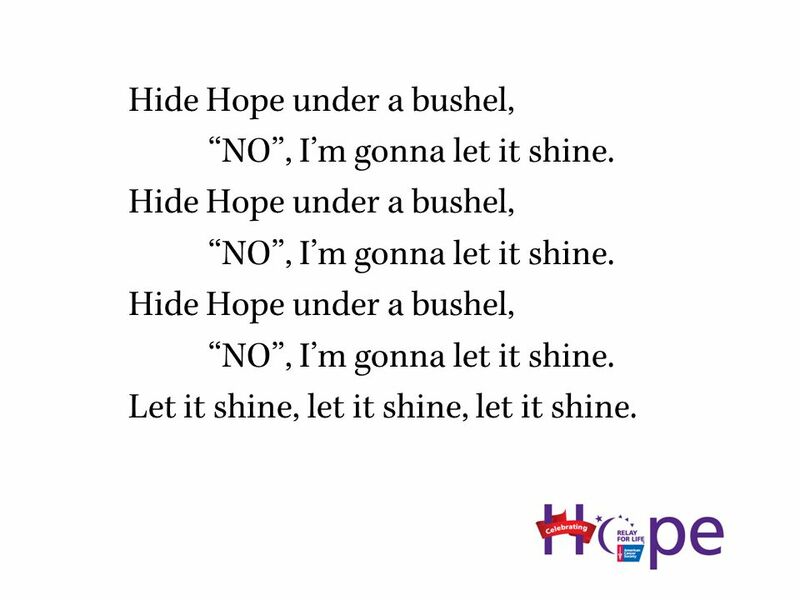 Hide Hope under a bushel, “NO”, I’m gonna let it shine. Hide Hope under a bushel, “NO”, I’m gonna let it shine. Let it shine, let it shine, let it shine. 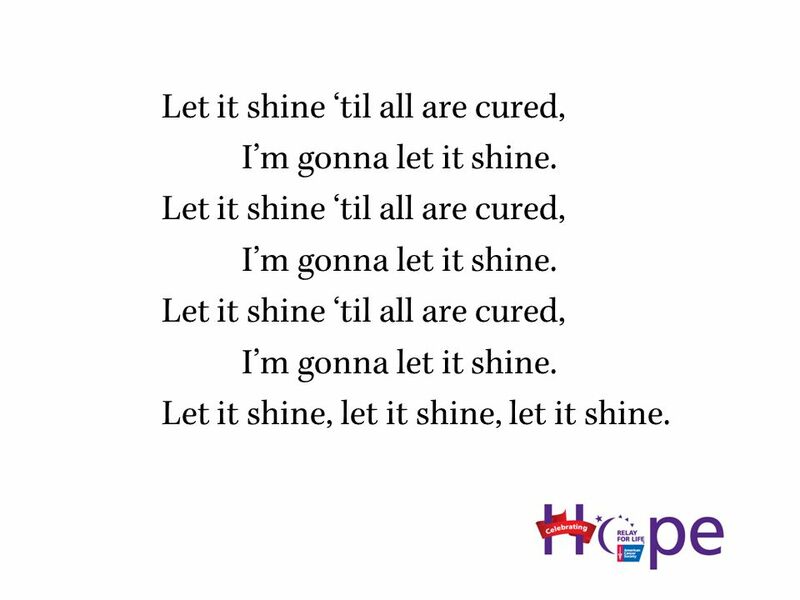 6 Let it shine ‘til all are cured, I’m gonna let it shine. Let it shine ‘til all are cured, I’m gonna let it shine. Let it shine ‘til all are cured, I’m gonna let it shine. Let it shine, let it shine, let it shine. 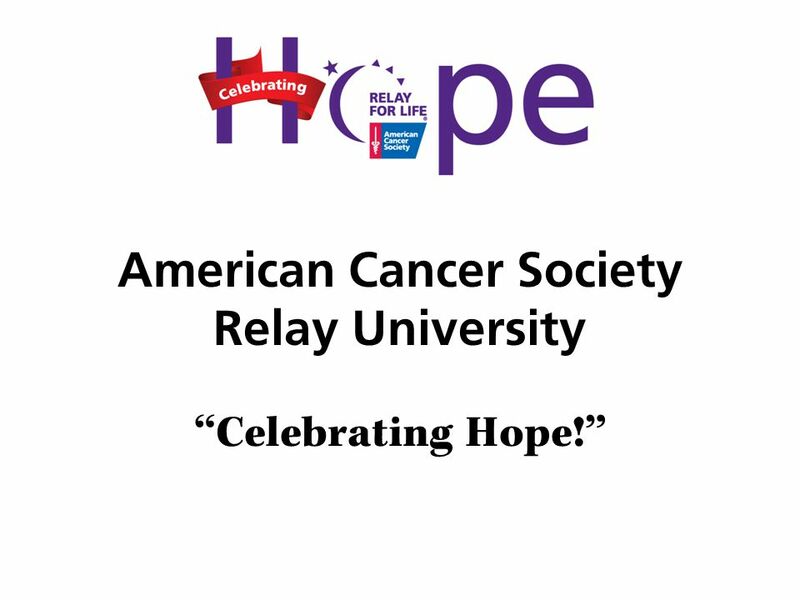 Download ppt "American Cancer Society Relay University “Celebrating Hope!”"
This Little Light of Mine. This little light of mine, Im gonna let it shine. This little light of mine, Im gonna let it shine. Second 100 High Frequency Words upon because mother. If I give my heart to you Will you handle it with care? We Are A Bright Shining Star Created For Jodi Jesus Loves Us And We Shine Brightly For Him. 1-1 I’m Gonna View That Holy City I’m Gonna View That Holy City970. HALLELUJAH, GET ON BOARD. The gospel tain’s a comin, I hear it just at hand; I hear the car wheels mvoin, and rumblin Through the land. Call Your School Test Practice. Secretary Hello. This is the ESL Department at Fremont Adult School. Something inside so strong Reflections on Hope and Resistance in the Holy Land.